Here at Rhopoint Components we are dedicated to helping the customers from space, military and aviation industry find what they need easily and efficiently. We can offer a range of resistors with ESCC 4001/027, ESCC 4001/028, EEE-INST-002 or MIL-PRF-55342 certification from industry leading manufacturers such as Isabellenhütte, Ohmcraft and VPG. Speak to our technical team about how we can assist with your project - whether technical information, supply of more economical standard (non-space approved, etc.) components for the initial testing or supply and delivery planning. The SMP-PW surface-mount current sensing resistor series from Isabellenhütte offers SnPb tinned connections suitable for aviation and aerospace applications being ESCC 4001/027 qualified. The design for high power ratings and low internal temperature rises due to the larger pad termination sizes. The Manganin® alloy resistance element has a resistance range of 0.005Ω to 1Ω, TC of below 50ppm/K over the temperature range of +20°C to +60°C and offers excellent long term stability. The SMP-PW model offers these capabilities in a 2010 chip size. The SMT-PW surface-mount current sensing resistor series from Isabellenhütte offers SnPb tinned connections suitable for aviation and aerospace applications being ESCC 4001/027 qualified. Designed for higher power ratings and low internal temperature rises due to the larger pad termination sizes. The Manganin® alloy resistance element has a resistance range of 0.004Ω to 4Ω, TCR of below 50ppm/K over the temperature range (between +20°C and +60°C) for resistance values of 0.010Ω or more and offers excellent long term stability. The SMT-PW model offers these capabilities in a 2817 chip size. 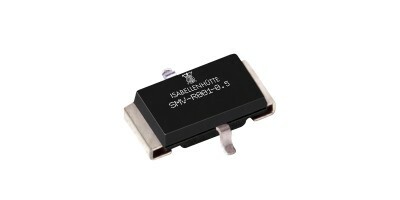 The SMV-PW 4-terminal surface-mount resistor series from Isabellenhütte offers SnPb tinned connections suitable for aviation and aerospace applications. Developed with being ESCC 4001/028 qualified, temperature range of -55°C to +140°C, with a 3W permanent power at 80°C and selective resistance values available are between 0.0033Ω and 1Ω. The SMV-PW series from Isabellenhütte offers high pulse power rating and are suitable for reflow, infrared and wave soldering. The MCH3512 military grade high voltage chip resistor series from Ohmcraft® offers a voltage rating of 3.5kV, power rating of 2W and a resistance range from 10kΩ up to 50GΩ all in a 3512 chip size package. By utilising their patented Micropen® precision printing technology, they are able to provide a superior precision, thick-film surface-mount resistor. MCH3512 resistors offer very low noise, ultra-high stability with tolerances down to ±0.1% (between 10kΩ and 100MΩ), TCR as low as ±25 ppm/°C (between 1MΩ and 500MΩ) and VCR down to 1 ppm/V. Ohmcraft's military SMT chip resistors have an extended TCR temperature range (-55°C to +125°C) and are stringently inspected. The MCH4020 military grade high voltage chip resistor series from Ohmcraft® offers a voltage rating of 4kV, power rating of 2W and a resistance range from 10kΩ up to 50GΩ all in a 4020 chip size package. By utilising their patented Micropen® precision printing technology, they are able to provide a superior precision, thick-film surface-mount resistor. MCH4020 resistors offer very low noise, ultra-high stability with tolerances down to ±0.1% (between 10kΩ and 100MΩ), TCR as low as ±25 ppm/°C (between 1MΩ and 500MΩ) and VCR down to 1 ppm/V. Ohmcraft's military SMT chip resistors have an extended TCR temperature range (-55°C to +125°C) and are stringently inspected. The MCH5020 military grade high voltage chip resistor series from Ohmcraft® offers a voltage rating of 5kV, power rating of 2W and a resistance range from 10kΩ up to 50GΩ all in a 5020 chip size package. By utilising their patented Micropen® precision printing technology, they are able to provide a superior precision, thick-film surface-mount resistor. MCH5020 resistors offer very low noise, ultra-high stability with tolerances down to ±0.1% (between 10kΩ and 100MΩ), TCR as low as ±25 ppm/°C (between 1MΩ and 500MΩ) and VCR down to 1 ppm/V. Ohmcraft's military SMT chip resistors have an extended TCR temperature range (-55°C to +125°C) and are stringently inspected. This FRSM ultra high precision resistor series from Vishay Foil Resistors is tested to EEE-INST-002 and MIL-PRF-55342, specifically for space and military applications. The 303261 series offers a resistance range between 100Ω and 2kΩ, in a small 0603 surface-mount package with wrap-around terminations. These resistors utilise Vishay Foil Resistor's newest Z-1 Bulk Metal® foil resistor technology for improved load life stability (up to 25ppm) and higher working temperatures (balanced temperature characteristics over a range from -55°C to +150°C). 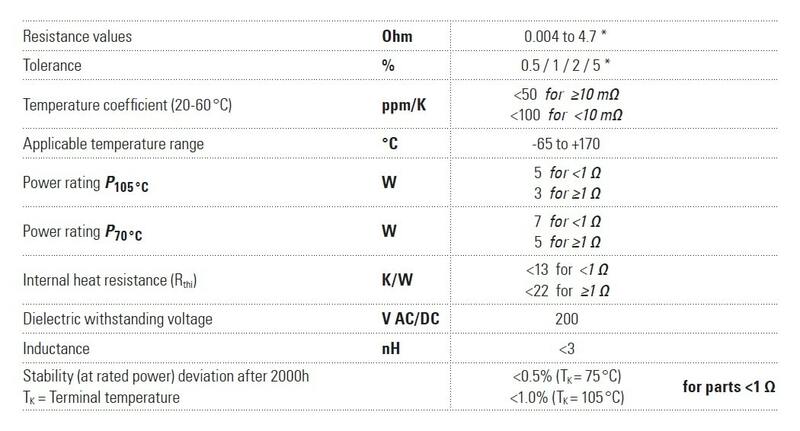 They have nominal temperature coefficients of resistance of ±0.2ppm/°C typical between -55°C to +125°C (+25°C reference) with tolerances available down to ±0.01% between 250Ω and 2kΩ. TCR as low as ±0.2ppm/°C between -55° and +125°C, +25°C ref. Non-standard technical requirements such as resistance outside of standard range, higher temperature application up to 240°C or better performance characteristics are available upon request. Please contact us for further information and availability. This FRSM ultra high precision resistor series from Vishay Foil Resistors is tested to EEE-INST-002 and MIL-PRF-55342, specifically for space and military applications. The 303262 series offers a resistance range between 10Ω and 5kΩ, in a small 0805 surface-mount package with wrap-around terminations. These resistors utilise Vishay Foil Resistor's newest Z-1 Bulk Metal® foil resistor technology for improved load life stability (up to 25ppm) and higher working temperatures (balanced temperature characteristics over a range from -55°C to +150°C). They have nominal temperature coefficients of resistance of ±0.2ppm/°C typical between -55°C to +125°C (+25°C reference) with tolerances available down to ±0.01% between 250Ω and 5kΩ.